Anna university announces Additional few corrections on PG. You can check here the corrections : Affiliated Colleges Nov/Dec 2013 University Examinations - Additions III in PG Time Table. Anna University has announced the First Year PG Programmee, Regulation 2013 university exam time table. 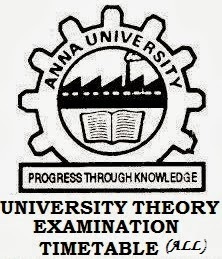 Anna university announces few corrections on UG - CSE Exam "For candidates admitted in erstwhile Anna University of Technology, Tiruchirapalli" you can check here the corrections of UG and also have some corrections on PG is here. Anna university make some few corrections/ Additions on UG & PG University Exam Time Table. For UG Examinations click here to check the Corrections. Click here to Check the PG Examinations Corrections/Additions. It will be updated after the Last Date for Exam Fee. Based on the Registration, AU COE Office can generate the Studentwise Individual Exam Timetable. So currently you are not able to check you exam timetable thru coe1.annauniv.edu Portal. 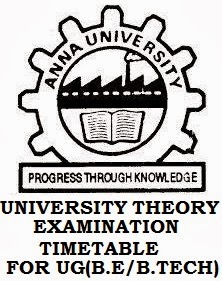 Anna University Exam Timetable for UG is announced today.